50 SMT007 MAGAZINE I NOVEMBER 2018 extensive testing of the assembly and clean- ing processes are necessary to ensure that all flux and processing residues are removed from the assembly. Implantable devices demand the highest level of cleanliness on the surface of the product but also call for 100% protection from any outside influences as well. This is achieved using a hermetic seal that can be as rudimentary as a compressed gasket, but bio- implants are more likely to use a full penetra- tion fusion weld. Medical devices that aren't placed in the human (or an animal's) body could waiv- er between Class II or III based on the end- use expectation. For instance, for monitoring equipment that is not hermetically sealed but has an uninterrupted on-demand operation, cleanliness is just as important. Consider one supplier that met all the cleanliness require- ment as directed by the customer but saw a rash of field failures. They had tested new pro- duction using ion chromatography and global and localized extractions and had very low lev- els of ionics, but the failures showed high lev- els of chloride contamination. 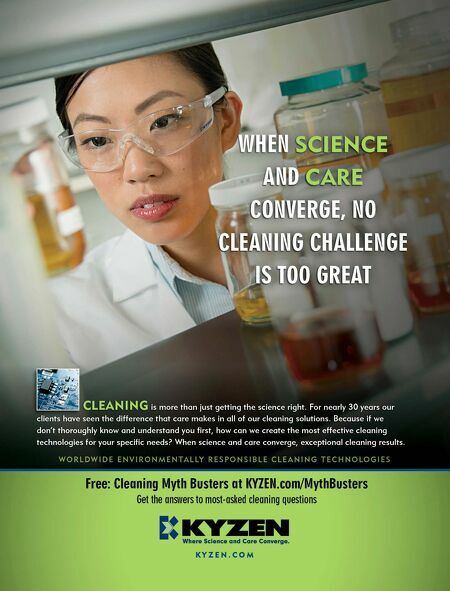 With the known baseline cleanliness levels, the focus became outside contributors. The field return housings were visually inspected but nothing was found, so the next step was to look at the housing ionically. An ingress path of cleaning solution was found using localized extractions in several areas around the housing on the inner and outer surfaces. The hospital cleaning staff was using a bleach and water solution on the monitor housings, and because they were not a hermet- ically sealed product, the bleach mixture had flowed into the housing. Bleach is very high in chloride, so it only takes a small amount to create an electrical leakage path and corrosion. The fix was to include a small bead of indus- trial assembly adhesives (RTV) around the housings to help eliminate the ingress path, along with alerting the cleaning staff not to use excessive amounts of solution when clean- ing that type of equipment. The point of this example is that it isn't always the fault of the assembler when it came to the high-reliability product failure. The next example of a medical equipment failure concerns one of the previously men- tioned devices—glucose testers. The prob- lem was thousands of units were showing up at the customer location with dead batteries. The product was built with a no-clean flux, so there wasn't an opportunity to remove excess manufacturing residues from contaminated components. This is another case of the con- tract manufacturer not being the root cause of the failure; instead, it was a component man- ufacturer. A capacitor on the battery line had enough plating residues to facilitate a leakage path that drained the battery in shipment. In this example, the component manufacturing process did a poor job at neutralizing the end termination plating chemistries. 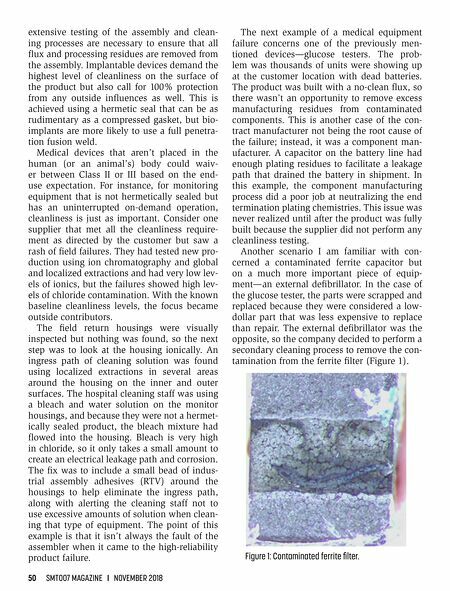 This issue was never realized until after the product was fully built because the supplier did not perform any cleanliness testing. Another scenario I am familiar with con- cerned a contaminated ferrite capacitor but on a much more important piece of equip- ment—an external defibrillator. In the case of the glucose tester, the parts were scrapped and replaced because they were considered a low- dollar part that was less expensive to replace than repair. The external defibrillator was the opposite, so the company decided to perform a secondary cleaning process to remove the con- tamination from the ferrite filter (Figure 1). Figure 1: Contaminated ferrite filter.